I have been using GitHub Pages to host my static websites for several years now. But recently, this error notice worried me. This happens when you visit my website, harishv.me, with a www in front. 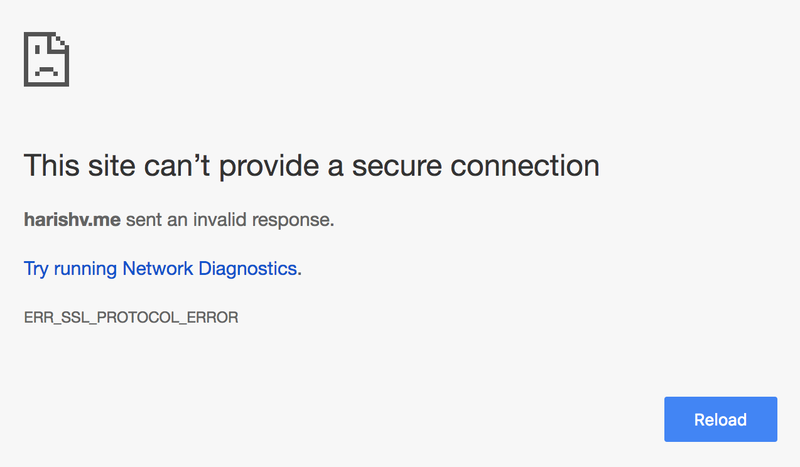 This redirects to https://harishv.me and all you will see is this ERR_SSL_PROTOCOL_ERROR as the site is unable to provide a secure connection. If you are using a normal GitHub Pages site, which means it has a domain that has .github.io, you can simply go to the GitHub repository you are using, click settings, go all the way down till you see Enforce HTTPS. Clicking this will mean that your site will always be served over HTTPS. When researching for free SSL options to add onto my website, I found that you can actually use Cloudflare’s name servers under their free plan to obtain a SSL certificate for your website. The asterisks are like wildcard patterns which means any URLs entered in that format will be enforced to utilise HTTPS connection. For example, www.harishv.me or http://harishv.me/blog will all now be enforced with HTTPS. That’s all folks. Get your free SSL certificate with Cloudflare now! P.S. If you’re wondering why is HTTPS that big of a deal, wait a few days for my next article on HTTPS - What’s the Big Deal?.